Colonel George Croghan, U.S. commander at Detroit and his superior, General William Henry Harrison, attempted to retake Mackinac in 1814. It was part of a two - pronged offensive the other being against Prairie du Chein on the Mississippi River. The goal of these attacks was to establish American control in the Upper Great Lakes. 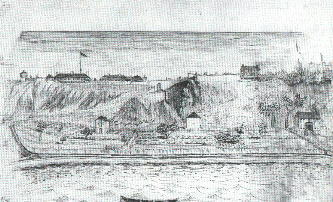 At Prairie du Chein the Americans were initially successful, and their success increased the strategic importance of Fort Mackinac. The American officers discussed whether they should first destroy Fort St. Joseph, on St. Joseph Island, seeing how it was the easiest target. They reached Fort St. Joseph on July 20th 1814 and burnt it, but they did not burn the civilian buildings, including the storehouses of the North West Company. The North West Company was owned by the American Fur Trader John Jacob Astor. There is certainly evidence that Astor had strong connections in Washington, and this may explain why Croghan was willing to leave so much of the civilan property on St. Joseph's Island intact. In the Canadian Sault St. Marie, Croghan and his men destroyed civilian property. Fort Mackinac was now commanded by Colonel Robert McDouall of the Royal Newfoundland Regiment. One of the first things McDouall had done when he assumed command was to build a blockhouse on the heights that enabled the British to capture the fort in 1812. On July 26th 1814 a squadron of five U.S. ships carrying seven hundred soldiers arrived off Mackinac planning to assault the fort. The landing force was commanded by George Croghan, the same man who held off Proctor at the Battle of Fort Stephenson. Croghan discovered that this fort stood so high that the naval guns could not be elevated enough to fire on it; thus the soldiers would have no support from the ships if they stormed the walls. For two days the U.S. ships shelled the fort with little if any effect- the shells all landed in vegetable gardens on the open ground below- the squadron pulled back out to sea in a growing fog, which lasted a full week. Then as the weather cleared they came in at the western end of the island, as the British had done in 1812. After heavy bombardment of the area by the naval guns, the soldiers landed. Led by Major Andrew Holmes, they worked their way through dense woods in which lurked hostile Indians, and over a ridge into the flat, open clearing of Dousman's farm. Instead of letting himself be penned up in the fort, McDouall, who knew the ground well, placed his small force behind low breastworks at the opposite side of the clearing. In addition to their muskets and rifles they manned two field guns. As the Americans came into the open the British had ideal targets; they killed thirteen including Major Andrew Holmes and two other officers, and wounded fifty-one. Croghan pulled his men back into the woods and down to the beach. There they climbed into the boats and rowed back to their ships. The next day the Americans sailed away. Mackinac remained firmly in British hands. The National Society of the U.S. Daughters of 1812 erected a plaque to Holmes and unknown American soldiers who died at the 1814 Battle of Mackinac Island. *NOTE* After the war of 1812 the British once again turned Fort Mackinac over to the Americans because of the Treaty of Ghent. However this was not until July of 1815.